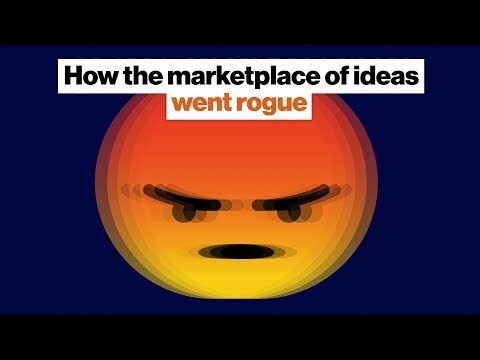 I've been thinking a lot recently about this idea of the marketplace of ideas. top, that the best ideas displace the worst ideas. can beat a better product in the marketplace. either completely untrue or that are appealing to our worst instincts about each other. Nobody wants some random person off the internet to do their brain surgery, right? Experts have a place in our society and journalism is a form of expertise. And I think that's gotten obscured by a couple of things. actually really confusing to people. have not truly had the interest of their readers or viewers at heart. isn't paid for by advertisements. 90 percent of what people observe to decide how actually to behave here. who don't act with integrity aren't getting fired. Then it doesn't matter, right? the same things that get you promoted also get you fired. are the things that elevate you as someone who's on Facebook or someone who's on Twitter. It's a thing that drives engagement. the platform if you're Alex Jones or if you're someone who's just a little bit too incendiary. to be heard at all. with whatever values they state. privilege some kinds of conversation over other kinds of conversation. It's going to be better for some users than others. to decide what the physics of this system are.